Lava flow from previously in the week. Photography by Paradise Helicopters. As I have perused the internet in the last few days I have noticed that the “gargantuan landslide causing a mega-tsunami” meme is in full swing again, now in relation to Kilauea. Therefore, I think it is time to write a more laidback article about what is happening in that regard with Kilauea. But before that I think we could do with a brief update on what is happening at Kilauea. Road being destroyed by eruption. As some might remember I jokingly said that the most likely time for the sinking lava in the caldera to hit the watertable was at 10.14 CET today Sunday. It was based on the known rate of ascension and the depth estimated by the USGS of the watertable. So far, the amount of visible steam has increased, but not enough for it to be a done thing. It is though in the making. After that it is just a waiting game for rockslides to cause ash explosions. As long as you are not around you are not in any grave danger. But, if you are down wind and there is ash in the air you can if you wish wear a particle filter to avoid getting ash into your lungs. Do note, if you are planning to be in an area with a lot of gas, go for an acid gas classed filter. Or, if you can’t get hold of that, make a simple mask of five layers of gauze that you keep damp. The moisture will catch the sulphuric gases turning them into sulphuric acid. Best is though always to be upwind of both ash and gas (if possible). It is a neat and cheap trick that I learned about in Indonesia. To reiterate, ashy detonations in the caldera will not be a danger to life and limb, and there will not be a pyroclastic flow. This is not that type of volcano. The tiltmeters have started to flatline. This is a sign that the temporarily low pressure in the dyke has started to go up. This was bound to happen from the inflowing magma. This may mean that the vents around Leilani Estates could have a longer duration and erupt more lava. The vents at Leilani seems to have started to migrate further east sparing houses and homes of the locals. As I am writing this we have come up to 17 confirmed vents. I do suspect that there will be more vents opening up in the next few days. Or, one will open up and stabilize as a more permanent fixture. With a bit of luck such a vent will be away from the houses. And just to clarify things, this is a very small eruptive phase in relation to what Kilauea can sometimes do, and at this point there are no signs that this will turn into a major eruptive phase. Slump deformation map, aftermath of the M7.1 earthquake. Showing 0.5 of top movement and 2.5 metres of bottom flank deformation. In my latest article I wrote about gravity and it’s affect on volcanoes. Because, the simple truth is that what comes up, must always come down. The question is more about when, and in what manner, it will come down. There are a lot of factors that will decide when, at what speed, and in what manner. I will try to go through at least the most important of those factors below, but first we have to go through the 3 most common types of mountain movement that affects volcanoes. This was not widely discussed before around the year 2005. Then slides around volcanoes became sort of a fashion thing with geologists. As usual the hysterical English tabloid press got hold of it, and we became inundated by magnitude 69 earthquakes causing 1000 meter high tsunamis of doom as entire continents fall out into the ocean. We are still mopping up things after this PR-slidemageddon. So, let us instead look at things calmly. What is what, and specifically, what is Kilauea doing? Before that I will though go public with the following public service announcement: If your greatest wish in life is to stand on a surf-board and do the largest possible rock-slide surf, Kilauea is not your best bet. The slide – This is when a volcano (or mountain), due to the effects of gravity (or magmatic intrusions), develops faultlines and a portion of the mountain rapidly slides down and outwards. The slump – This is when instead of rapidly sliding downwards, a portion is slowly gliding down and outwards. This gentle meandering of a mountainside happens at speeds measured in centimetres to metres per year. The hybrid – This is when smaller portions rapidly slide off as a large portion of a mountain is gently slumping downwards. I will now go through 4 factors that apply to how a mountain will behave as it is galumphing downwards. These are gradient, rock-or-rubble, fault-layout and buttressing. Gradient – or in other words, how steep the edifice of the volcano is. The general rule here is that the steeper the edifice is, the more likely it is to catastrophically fail. A tall and steep strato-volcano is far more likely to slide than a gently sloping shield-volcano like Kilauea. The grade needed for a mountain to start sliding depends on a lot of factors and is hard to calculate. And sometimes a volcano can happily be stable at let us say a 45-degree angle but will become extremely unstable at say 48 degrees. If such a volcano inflates rapidly from intruding magma it can fail, say hello to Mount Saint Helens. Kilauea is a gently sloping shield volcano above the surface. It is steeper below sea level, but not so much so that it is prone at this geologic point in time to fail rapidly. Post flank-collapse image taken from Acatenango overlooking Fuego in Guatemala. The visible flank collapse scar is the remnants from a flank collapse that slid all the way out into the Pacific Ocean 80km away. If one look carefully one will see that part of the mountain is over-burdened and prone for another collapse. Rock-or-rubble – the type and constituency of the rock in the volcano also plays a significant role in how it will be moving about. These lava layers are far more stable than ash, lapilli and pumice. Kilauea is predominantly erupting lava in thick stable flows. Below the ocean level it tends to produce pillow-lavas in the shape of big round balls. These are not as stable as lava layers, but deeper into the mountain these balls are welded together by lava, and then pillow lava turns stable. Strato-volcanoes like for instance Fuego in Guatemala, or Hekla in Iceland, produce far more ash, pumice, lapilli and lava-bombs than Kilauea ever will. In these cases, you end up with volcanoes that are loose rubble piles made up of what feels like ball-bearings (at least if you try to walk up them). To compound things, this ball-bearings are produced by strato-volcanoes and not shield-volcanoes, and as you now know, strato-volcanoes are also far steeper. To sum it up, Kilauea is a gently sloping thick-lava-layered volcano. Not many points on the slideometer so far. Fault-layout – This is where Kilauea actually get a few points. It does have a fault system of a type associated with movement in volcanoes and mountains. But, here it grows boring once again. The angles of the faults are not in angles conducive to rapid large movements. Instead they are of a type associated with slow down and outwards movement. At strato-volcanoes like Fuego you get steep faults forming prior to flank-failure. And there is nothing like that here. I should also here point out that there is no risk that Kilauea will go and do something as boisterous as the Mount Saint Helens flank-collapse. Kilauea is just to gently angled and too big for that to be possible. It would require hundreds of cubic kilometres of rapidly intruding magma for it to happen, and that will never happen since Kilauea is leaking lava like a sieve all over the place. So, that leaves us with Kilauea having gotten a few points on the slow slumpometer. Buttressing – this is any force or matter that will hold back, or slow down, a slide or a slump. In Kilauea’s case there are at least 3 things buttressing the volcano. First, we have Mauna Loa, it is holding the north flank of Kilauea in check. So much so that the slumping of Mauna Loa’s 75 000 cubic kilometres of rock is slowly pushing the entire Kilauea towards the ocean. So, the north side will not go anywhere. On the other side we have a rather big seamount called Loihi. It is the next volcano growing in the chain, and even if it is not of Kilauea’s size, it is big enough to create a resisting force for the bottom of the south flank. In other words, it slows things down. The third thing has a smaller, but in many ways more profound effect, and that is water. The Pacific Ocean packs a lot of mass. And that mass equals a rather sturdy brake on things trying to move fast. Now many people will shake their heads and say that water is flexible. Yes, it is, but it will still work as a brake. We know this very well from historical data. 20 000 years ago, the ocean level was far lower due to the water being pent up in the continental glaciers of the ice age. It is around this time we have most of the large slides at volcanic islands around the world. So, Kilauea is quite high on the buttressometer. Bad day to be a road. Photograph from Paradise Helicopters. By now our aspiring slide-surfer is crying into his can of board-wax as he realises that he will have to go and find a better volcano to surf down. Parts of Kilauea is slowly slumping down into the ocean, but at such a sedate and majestic pace that even houses close to the ocean will remain above water for quite some time. Small parts will now and then break off at a more rapid pace, but this is mostly lava edges that grow steep cliff faces as lava pours down into the ocean. Last time this happened was during the ocean-entry phase of the 61g lava-flow. Now and then there will be earthquakes, but that is the nature of things. Those earthquakes will not be so bad that they will kill a lot of people, if the houses are built to cope. And now and then lava will come up out of the ground along the rift zones of Kilauea. But what will not happen is that there will be a large slide and a big tsunami, regardless of what the English tabloids write. ← Kilauea: If wishes were horses! The fountaining seems to have stopped for now, but the steam explosions are still going strong. Aerial view of the lave field and fissure here. This is a Civil Defense Message for Monday, May 14 at 7:25 in the morning. Hawaiian Volcano Observatory reports a new fissure in Lanipuna Gardens Subdivision has opened between fissure 15 and 16 at this time. Be aware, no sightseeing is permitted in the area. can you rewind a live shot from facebook? Rescued from the clutches of akismet! USGS now confirms it: “A fissure 19 has been spotted very near fissure 15 as of about 8 am just northeast of Pohoiki Road and north of Hinalo Street at the east end of Lanipuna Gardens. It is producing a sluggish lava flow.”. — What a coincidence: I was just eating my evening Pohoiki Salad! The big one in germany trumbel. One 4.0 and a fare amount of 3. Do we in the north have to fear this one in the near future. Depends on the timescale. Human time, probably not. Geological time, yep. Caveat Emptor. → The property sits on the side of an ACTIVE volcano and, has been in a state of eruption for about 30 years. Those pretty hills nearby? Those are scoria cones. How do you think they got there? Hint, through the very same process that we are seeing going on right now. There is not a single piece of ground in the state that is not associated with having come out of one of those volcanoes. Personally, I live in a hurricane strike zone. On an estimated average, this town gets nailed about once every 35 years. Knowing this, I selected a property 120+ feet above sea level specifically to avoid the hazard of storm surge. Sure enough, 4 years after moving in, the town was hit by Ivan. Downtown Pensacola reeked of fish and feces for 3 months. Hazards are a fact of life. Ultimately, WE as individuals are responsible for our own decisions and have to deal with the consequences of them. Thanks! I just have a wild hair about Homo Stultus making bad decisions but being fully incapable for accepting responsibility for them. I am also quite comfortable in knowing where I will be at in a few million yeas. I’ll be part of the strata that forms a new mountain range during the next phase of the Wilson cycle as the Gulf of Mexico closes. Roy and Barbara are friends of mine and have lived on both Maui and the Big Island as have I. They are not naive about the volcanic threats. My guess is she is referring to Puna Geothermal Venture (PGV). If you know any of it’s history you’d understand. It is poorly run, safety is nil, they have purposefully deceived the public about hydrogen sulfide emissions and more. 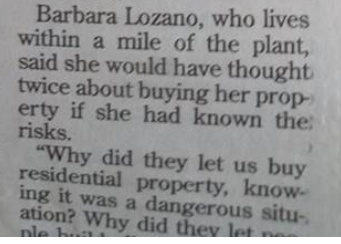 To the point the state of Hawaii purchased properties nearby and relocated families on their dime. The plant should be closed down and removed to protect the public. Residents of lower Leilani have suffered because of that plant for years before this recent activity started. Looks like the sort of place you don’t want to drop your mobile phone. Nice view of the fissures, though! I believe that station is highly impacted by traffic/human activity and ^ is mostly that. “Parts of Kilauea is slowly slumping down into the ocean, but at such a sedate and majestic pace that even houses close to the ocean will remain above water for quite some time. what do You all think>>>>?????? I think it’s quite valid. A good second opinion would be from GeoLoco, but I haven’t seen him around in some time. The really really bad part, is that you can only make inference about future possibilities from the available evidence and past behavior. Do the Hawaiian island volcanoes undergo catastrophic wasting events? Yes, they most certainly do on the geologic timescale. But just as often, (if not more so) they undergo slow slip events lasting thousands of years. All available data points towards the Hilina slump being a slow event. Humans being what they are (vapidly stupid and quick to blame someone else for their misfortune), anyone stating that there is no risk will be instantly blamed if something bad happens. Conversely, anyone saying bad stuff is just around the corner is instantly labeled a doom monger and alarmist. This is because the doom sayers are usually proven wholly incorrect time and again. Media types preach the doom scenarios because many of the population get off on doom and gloom. It gives the media shits an instant audience to drive up their eyeball population which they can then sell to advertisers. In effect, monetizing terror. Claim 1000 disasters that never happen and nobody remembers a single one. Claim one thing isn’t going to bea disaster that turns out to be even a small one and its brought up time and time again for 20 years. That’s good, it offers a counterweight to the alamists and fearmongers. CARL REHNBERG, VOLCANOLOGIST… Nice one! I personally explain it more as a crack that is occasionally widening and filling with lava. The whole slowly sliding in the ocean is interesting for geologist. But for the average humans the timescales involved are so large you may aswell call it stable. So are there any non facebook streams I can watch? Dunno… but the a few days ago, VolcanoYT was relaying the Travis Sanders feed on youtube. While listening to the Brett Adair feed, the background conversation noted that a cell provider had found out that people were live-streaming and boosted the available bandwidth for the local cell tower. The Brett Adair feed seems to be a bit further from the flow itself, so his phone will be less likely to go into overheat mode like one feed kept doing. One hazard that keeps messing with the feeds is when the wind shifts and puts the volcanic gasses across their location. Brett Adair is a well-known stormchaser. He’s not simply using his cellphone like most others do. A relation of the guy who put oil well fires out ? It wont let me post, go back and look for link to Brandon Clement. I replied, so 9 posts above mine on page before this one, halfway down page. Wow, I’m back and it actually looks the same, I wonder if the apparent decrease in the height of the fountains is a result of the night allowing the lava to glow the entire time it is in the air, while in the day it only glows where the vent is and the fountains look like small black rocks being thrown into the air. It looks like a lot of the rocks still reach high above the trees, like last night. I have had a couple of different live streams up during the day and it has remained steady. The night shots are of course breathtaking. Yes, I can agree with you there. I’m watching the livestormchasing one, it has the best quality (although they are all pretty good). The lava was about half way to the sea on Bruce Omori’s video from 9 hours ago, and fissure 17 had been going for about 12 hours by that time, so I wonder how close it is to the sea now? I mean it is flatter near the coast so it probably isn’t really close but I’m sure it is a lot closer than it was then. Given that the fountains aren’t really like a jet of molten material, and more like a continuous spray of lava fragments, I’m guessing most of the lava is erupting non violently directly into the lava flow. In the 1960 eruption there was some more fluid lava that started erupting a while into the eruption, with the first bit being mostly 1955 magma and the second part was 1959 summit magma that was very fluid and was characterised by very high lava fountains, much like in 1959. So far this eruption has probably only erupted old magma that is left over from 1955 and 1960, or there would be some more fluid lava erupting somewhere. New magma will probably erupt at this vent because it is the only one to have stayed active for more than a day so far, and it is much bigger than the other ones. The fissures through leilani up to and including fissures 18 and 19 (started today) were all on the same line, which has been characterised by brief eruptions in a semi-random series, while fissure 17 is offset to the north and probably related to the hwy 132 cracks found the other day. A couple FB posts on a couple pages mentioned that O’o magma was now being erupted. Haven’t seen any govt confirmation, though–and you can’t see much of a difference in eruption style yet. maybe the way it is being erupted is causing it to change into a’a. These eruptions are much more violent than the almost invisible flows at pu’u o’o before, and the eruption rate is almost certainly a lot higher, so even though it is possibly new magma it is being disrupted so much in the eruption process that it is erupting as viscous sheet flows. maybe this is actually what eruptions usually look like here but people were more interested in the 500 meter tall lava fountains during 1960 so the earlier flows were ignored somewhat? Or the posts were wrong and this is still 1924/1955/1960 hybrid magma. Sometimes Not Now isn’t shown. Still try & scroll the screen down on the right. Try clicking on video again to start it, then click on bottom right of video to enlarge. It works for me, sorry if it doesn’t for you. kupd showing lots of noise from 15:09 to 15:25 ish.. Shows on NPOC and JUCZ also, but not as much. 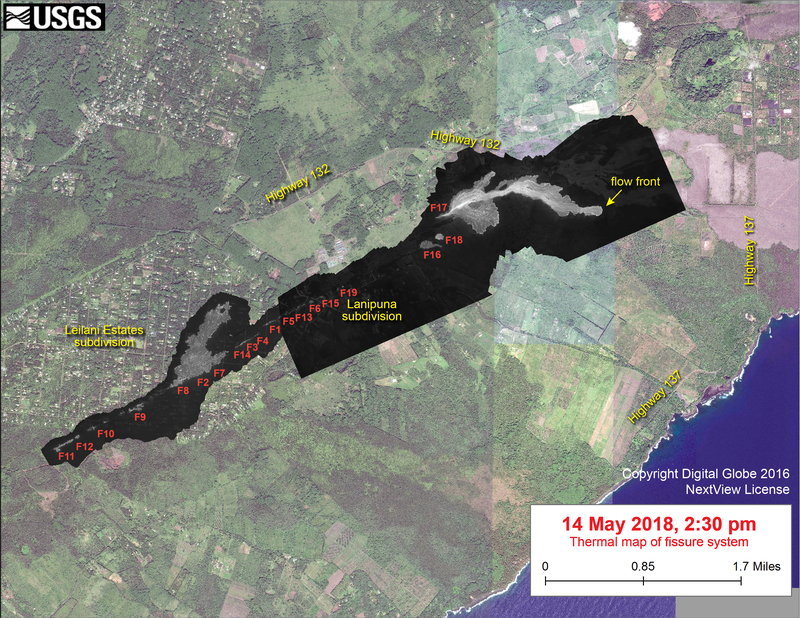 There is a new map of this lava flow on the HVO website. The outline of the flow is from their overflight around 7:00 in the morning, but there is a red dot of the flow front at 2:30 in the afternoon and it has moved significantly. Only 7.5 hours to flow about 600 meters, so this flow might be viscous and blocky but it is flowing at a pretty fast rate. The distance to the ocean along the steepest descent is about 2.6 km so at the rate of 600 meters in 7 hours it should be there around two days from now, unless the vent gets bigger in which case it will be less. I guess it will also be less if the lava becomes more fluid. It looks like that red dot on the map is right next to a stream. Hopefully the lava will follow the stream to the ocean. Those arent actual streams, they are lines of steepest descent. There are no water courses on the southern half of the big island because fresh basalt is very porous and water just absorbs into it, also kilauea is so active that basically the entire surface of it is 90% likely to be covered in lava in a 1000 year period. If there were watercourses on kilauea then they would be where the blue lines are though, and because lava is a liquid it will follow those lines too, roughly. It worked in predicting where the June 27 flow would go, and where the 61g flow would enter the ocean, so it works pretty well. This signature is only evident at WOOD, SPD, and KAAD… it also shows up at TOUO and less so at MOKD. 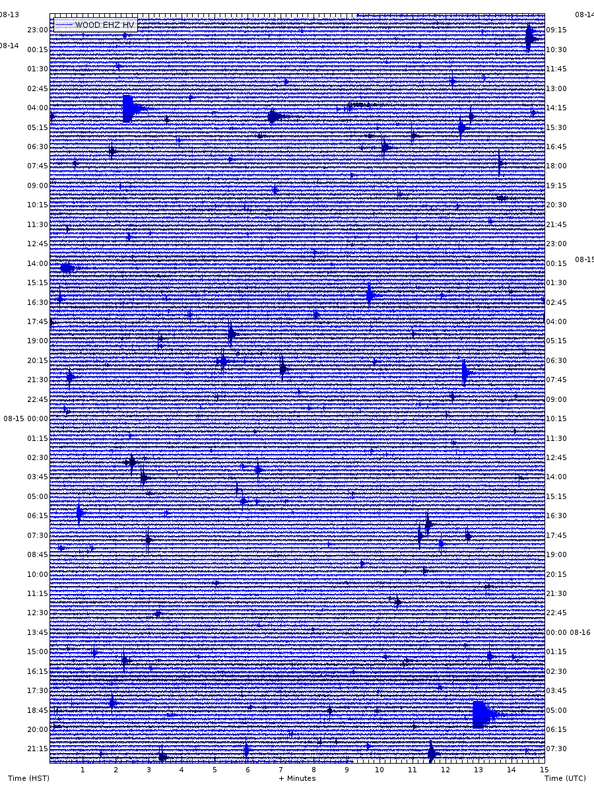 It is invisible on the Kilaeuea-proximate seismograms. So WHAT is THAT!?!?! See this outline of where those two enormous tremors occurred /impacted — the region was very specific! Look at how much less the seismic impact is immediately east of WOOD. 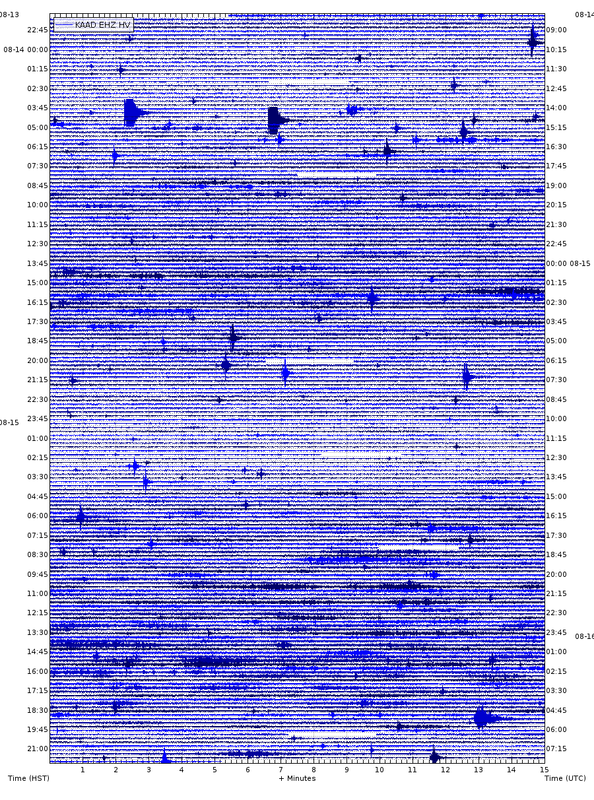 Something is happening to Mauna Loa…. Here is the KAAD 6-hour… it is most intense here… ????? looks like an eruption? Could be settling a bit from the 6.9 reducing pressure on its flank. Historically isn’t this what could plausibly cause massive landslides vs. Hilina slide? There is a reason Mauna Loa’s flanks are littered with the remnants of these events… I think Hilina is unlikely but Mauna Loa shrugging off 100-200KM^3 at once is kind of no big deal, and that alone would still be sufficient for very substantive damage. With its “brittle” western flank, the provocations from Kilauea’s dyke activity may be sufficient to provoke enough settling that history repeats. The activity at kilauea is on the east rift. Mauna loa is west of kilauea, so mauna loa is on the other side of kilauea from where this eruption and everything associated with it, so there is really no destabilizing happening on mauna loa from this. Whatever happened at mauna loa in those tremors was not from it about to slide into the sea, if the 1950 eruption wasn’t able to push it into the sea I highly doubt a comparatively tiny eruption more than 70 km away is going to do anything. I guess the tremors might be related to an eruption, but I think if an eruption was about to happen the tremor would last much longer than it did and be much stronger. This seems to be coming from the south coast. A quick look at radar maps shows showers in that area, so this may be run-off. Photo of the fissure question is being asked is the house where Brandon Clement is filming from ? They are showing now possibly a new fissure ? If you mean the glowing lights above the explosive fountains, those are car lights. They are moving sideways and at the same position as the road. They are —very— unlikely to be ball lightning as has been suggested in the comment feed, which would be completely random and not appear in the same places exactly, or for that long. No it was not the bright lights it looked like another small ball of orange glowing lava. New message from the civil defence. ”Civil Defense Message for Monday, May 14 at 4:40 in the afternoon. The entire area behind the fissure is an active lava flow, and the area behind those trees is also a lava flow. They are looking towards kapoho crater which is basically almost east of where they are, and the main active lava flow is going to the east in that direction before going more south towards the ocean. The red glow is probably fire from trees, and if not that it is a patch of lava that isnt crusted over as much, if there was a new fissure it would have been pretty obvious that it was a vent and not a fuzzy glow. There is a new fissure though slightly uprift in lanipuna, but it is very small like the earlier fissures and has probably stopped now. Fissure 17 now, at the rate it is going the lava would be about 700-700 meters downhill from this picture, or about half way to the ocean. If you draw a straight line between the flow front on this picture and the middle of fissure 17, then you get the direction they were looking towards in the livestreams, and as you can see the road is right in line, so those glowing white spheres are very likely to be car lights. I was watching the livestream when people started getting interested in the glowing lights, and the first one was a glowing orange area just before it got dark. That was definitely a burning tree, as there appeared to be a tree behind it and the lava is in that area. This is such an excellent map, thanks to whoever is keeping it up to date! Great map that. Live cams are online again and seem to show a new fissure, not cars? That facebook link cam is showing impressive fountaining and gas explosions with that jet motor sounds. 16 seems be fountaining too now. It has been confirmed that new magma from under pu’u o’o and the summit is erupting at these fissures now, despite the apparent lack of change in viscosity. I guess the appearance of the lava is due to high eruption rates turning the pahoehoe into a’a even on a flat slope. Im guessing that the dike went through the 1977 magma and some of that magma got dragged down to this eruption, and that could be what is erupting now with the newer stuff, making it more viscous than it would be expected to be. As this goes on I think the lava will slowly get more fluid, and as the flow becomes more channelized it will be obvious. Could you give a source where they confirmed that it is new magma? All the official sites still say it is old. The lava flow is probably about 1 km longer than it was in the last HVO overflight too at the rate it is advancing. If it continues at that rate it will be in the ocean some time tomorrow, and from the look of the livestreams fissure 17 is very persistent and erupting just as strongly now as it was before, meaning the lava flow is probably flowing just as much as before. I guess HVO will say it is new magma in their next update. Really good explanation Carl…helps me understand a lot better. I live on the west side in Kailua Kona and some of my family are quite concerned for my safety. But so far, I feel pretty safe. You will be completely fine. There is at least 70 km between you and the eruption. If I understand that right now, do you want to cool down in a well to save on the geothermal project? If that is a good idea? That can go pretty well in the pants. is this the new fissure they are filming now I think it may be the one I commented on earlier this morning. Comments on the site are confirming fissure 20 has opened ? Yes there is a 20th fissure, it is east of leilani in a part of lanipuna gardens. No location on any maps yet but it is possibly a reactivated fissure 19 which was active there earlier today. I dont think it is having any affect on fissure 17 though, which is still easily fountaining twice as high as the treeline on the live stream, probably up to 100 meters at the main vent with explosions sending glowing bombs up to 400-500 meters high (maybe less than that but definitely a triple digit figure starting in a number bigger than 1). They are live again and are showing 2 new fissures south of the area they are in. I see some glow on PG cam. To the west so maybe a new vent or a older one reactivating? I wonder if this fissure will build a cinder cone when the lava around it hardens, its going pretty high. This is getting pretty big now, before fissure 17 all the fissures were erupting mostly one at a time for a few hours and were very small, but now there are at least 3 that are active at the same time and one of them is huge and still growing… I bet its because the new magma is starting to find places to erupt, first at fissure 16 and 17, and now back up the fissure to leilani. I wonder if it will cause the hwy 130 steaming area to erupt if this uprift progression continues. I guess once the magma directly from the summit chamber (overlook crater composition ?) gets down to the vents it will go even more. When new 1959 magma made it to the 1960 vents, it made them go from 100-200 meter fountains up to 500+ meter fountains and fluid lava rivers that reached the sea within a day and covered parts of the coast that were spared earlier… The 1959 magma was unusually primitive basalt for what usually erupts at kilauea, being picrite basalt high in olivine and borderline ultramafic, but the idea would probably still apply now with the magma from the summit very likely being hot and gas rich. The overflows from the lava lake in late April are an example, flowing out as sheets and covering hundreds of meters in only 10 minutes or so, as well as the explosive decompression that happened when rocks hit the lava lake, showing how gas rich the magma is. The lava that we see erupting with lots of gas they say came from the 1955 eruption that never made it out of the ground. 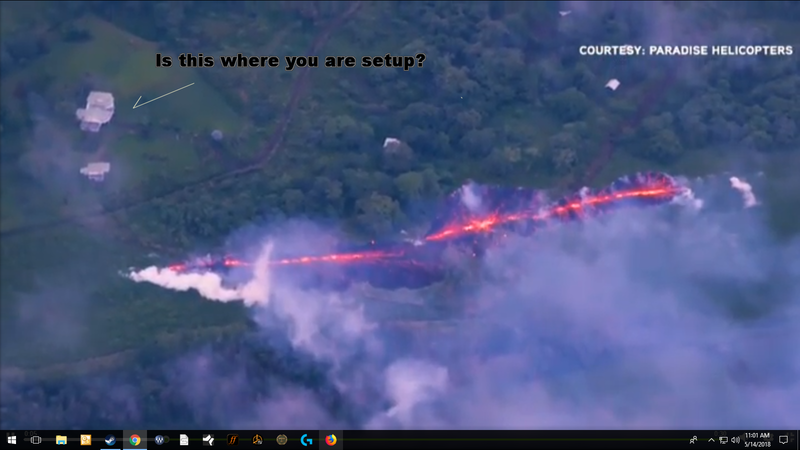 Back then we did not have puu oo vent but it is my understanding that the plumbing of Kilauea, puu oo, and the east rift zone are connected. If they are connected you would think that Kilauea could have degassed some of the 1955 lava. Any lava that moves through a dyke to the east rift zone we would assume would be degassed, no? Or is there a separate supply that taps Kilauea deep enough to supply fresh Magma? Or is all of the gas a side effect of the cooking for 60 years? Clear as mud? Or is it all of the above? I think the current period of high activity started in late 1950, not long after the eruption at mauna loa earlier that year. There were some intrusions into the east rift, and then in 1952 there was a very big summit eruption, it is completely buried now but if a repeat of that eruption happened now it would overflow halemaumau… After that the 1955 eruption happened because a bigger intrusion of combined 1950 and 1952 magma went down the still partly molten 1924 dike and erupted. Then in 1960 lava went down that same dike and erupted in the same general area again, and tiny eruptions happened 3 times further uprift on that same dyke in 1961, probably due to local processes as the summit tilt didnt change much during those episodes. After that pretty much all the magma stayed near the summit in the upper rift zone and eventually a stored magma body formed at the point where the east rift bends and mauna ulu formed over this, and I think that it probably would have resumed erupting for longer if the 1975 quake didn’t happen, but the quake did happen and created a lot more space for magma to go and the still open upper rift filled in the gaps over the next 8 years up to 1983 when pu’u o’o started. Obviously there was a completely open conduit in the east rift by now, and when this new intrusion happened two weeks ago the magma followed the weak spot left by the eruptions in 1955 and 1960 to end up where we are now. The rift was obviously still completely open because the summit has drained out by a huge amount. Most of it probably wont erupt anyway, but the amount of magma in this episode is probably enough to do a hell of a lot more than what has been done so far. I dont know what will happen in the future because the rift is still open and so eruptions in lower puna might be frequent to semi-continuous over the next few decades if the magma supply stays as high as it has been so far. In most of the first half of the last millenium there were eruptions on average every 7-15years in lower puna, while after 1790 there have only been 4 including this current one, so this area might become dangerous if a stable open conduit forms this far down. Keep in mind that kilaueas summit was also overflowing frequently and on a large scale between 1000 and 1470, and the big lava shield of kane nui o hamo (at least half the size of pu’u o’o) formed about 750 years ago too, so there are pretty striking similarities with the current situation… Im not sure if anyone has looked at that part of kilaueas history when comparing this current eruption, because the eruptions in lower puna separated by 60 – 100+ year time periods during historical time are unusual compared to most of the last 1000 years and might be a bad analogy for the future. It also might be important to note that both the 1955 and 1960 eruptions were by far the most intense in the last third of the eruption, with both of them going at least 100 m3 of lava per second, and probably a lot higher in 1960 at some points, holuhraun was going about 150 m3 per second most of the time so that gives you something to compare to. I spent a while reading PDFs written by the HVO head scientist in the 1955-1960 period. Basically this eruption is completely following those eruptions, though it has been slow to take off so far although I think that has changed now with fissure 17 erupting new lava. I may be completely off track here, but I think I recall in one of the update videos from HVO, did one of them say that the currently erupting lava was actually from an eruption a couple of hundred years ago? Some more very faint glow just above the left side of the group of lights. Yea the fluidity of the Hawaiian hotspot is totaly amazing. Halemaumau is likley the worlds most fluid basalt lava, sometimes it reminds me of a pot of liquid aluminium in daylight when the sun shines on the lakes skinn. The most recent overflows are the largest since 2008. Overflow rates was likley over almost 100 cubic meters a second! Kilauea probably has the most fluid ‘normal’ basalt though yes, and I think it also had the biggest lava lake before it drained, 220 meters across I think. Gut feel from a non-expert. I think that the summit will undergo a highly energetic event around 25 May. This could result in damage to the plumbing and eventually shut down the eruption along the eastern rift. Exactly how bad will it be? Really depends on how it works out. 1924 was quite energetic. I imagine that what might happen would be at the high end, a repeat of 1924. Super Caveat. I AM NOT a geologist. My evidence is coincidental at best. Nothing in my rumination has any validity other than what I have stated. As for land movement, the Hilina slump has been going on for many many years. 1924 does not seem to have caused a slide catastrophe, I don’t see why a repeat would be any different. In a separate comment I made a few days ago, I proposed that the large catastrophic mass wasting events (big arsed land slides) of the Hawaiian islands (there have been many) may be due to a cessation of active suturing by dikes along volcanic systems. My reasoning is that active dike formation/reinforcement could be like adding new stitching to hold the island together. The Nuʻuanu Slide that formed the Tuscaloosa Seamount seems to have occurred after the main focus of volcanic activity shifted to another location. At the time, Maui Nui was 40% larger than the island of Hawaii. Today, Oahu is part of the remaining structure of that ancient island. I reiterate: I’m not an expert or a geologist.